Saints ruckman Tom Hickey has dominated this game. He has 29 disposals, ten clearances, five tackles, four inside 50s and 39 hitouts (including ten to the advantage of a teammate). Swan Jake Lloyd's 28 disposals have come at an outstanding efficiency of 93 per cent. He also has six marks and six rebound 50s to be an influential player in the game. The Saints have eight of the last nine clearances, and this has led to an advantage of 2.2 to 0.1 on the scoreboard during this period of dominance. St Kilda InterchangeNathan Wright off due to an injury. Lance Franklin kicked multiple majors in 20 of 26 games for Sydney in 2016. He has matched this feat again today, but his two goals have come from five scoring shots (40 per cent), well down on his career conversion rate of 58.6 per cent. St Kilda recruit Nathan Brown is doing the little things to endear himself to his new teammates. He has five onepercenters, a tally only matched by Swan Sam Reid. Sydney Swans InterchangeHarrison Marsh replaces Heath Grundy and is possibly out for the game. The Saints controlled the third term inside 50s by a margin of 20 to 11, helping them to win the quarter 4.4 to 3.2, and thus reducing the Sydney lead to just a goal. Sydney Swans InterchangeKurt Tippett off due to an injury. Sydney's Daniel Robinson has increased his clearance tally to seven, including three in the third term. Next most on the ground is St Kilda ruckman Tom Hickey with six. The only multiple goalscorer on the ground is Mav Weller who has kicked two straight for the Saints. He kicked at least two goals in five of 22 games in 2016. St Kilda InterchangeJack Steven replaces Maverick Weller and is possibly out for the game. Kurt Tippett averaged 1.6 contested marks per game for Sydney last season. Today he has three to lead all players on the ground. Seven of the Swans eight goals have the been the result of a disposal chain that commenced with a St Kilda turnover. The Swans have seven of the last eight inside 50s, dating back to late in the second term. Sydney Swans InterchangeJordan Foote replaces Callum Mills and is possibly out for the game. Both sides disposal efficiency in their forward 50 was just 62 per cent (Sydney) and 54 per cent (St Kilda) for the first two quarters, contributing to more behinds being scored than goals. David Armitage averaged 21.7 disposals per game last season for St Kilda, well down on his careerbest of 28.4 in 2015. So far today he has 14 disposals at 86 per cent efficiency, and has laid four tackles. Swan Dane Rampe's ten first half disposals have come at 90 per cent efficiency. He has also directed three spoils to the advantage of a teammate, leading all players in this category. After Jack Steven of St Kilda achieved the first inside 50 of the second term, the Swans generated the next five, capped off with the goal to Harry Cunningham. St Kilda ruckman Tom Hickey holds a slight edge over his Sydney counterparts in the hitout department, 1110, yet has only directed one to the direct advantage of a teammate. While some clubs have sat namedplayers for the entire duration of pre-season matches, all players in today's game received game-time in the first term with the exception of Saint Jack Lonie. Four firstquarter tackles for young Saint Jack Steele almost eclipses his 2016 per-game average of 4.1. Swan Luke Parker had the most prolific season of his sixyear career in 2016, averaging 26.9 disposals over 26 games. He has six disposals already today, at 67 per cent efficiency, which is in line with his 2016 mark. 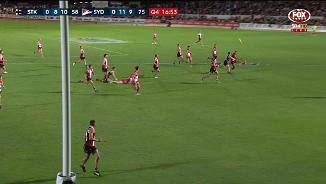 The opening two goals for the game have been sourced for Sydney directly from a St Kilda turnover. 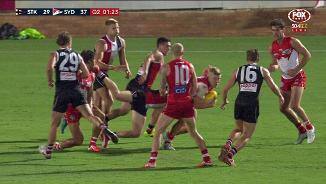 St Kilda InterchangeJimmy Webster replaces Nathan J. Brown due to the blood rule. After 11 games in the past two seasons with Sydney, Daniel Robinson is putting his hand up for Round 1 selection. He has five disposals in the opening ten minutes of the game. The Swans lead the inside 50 count early by a margin of five to two, but neither team has been able to produce a major. After 74 games over seven seasons with the Eagles and Bulldogs, the Saints recruited Koby Stevens to shore up their midfield depth. Stevens has a career average of 17.7 disposals per game. A virtual recruit for the Swans this year is big man Sam Reid, who missed the entire 2016 season. In 22 games in 2015, Reid was good for 13.5 disposals and 5.8 marks per game. Welcome to Lavington Sports Ground for the St Kilda v Sydney Swans Round 4 clash. SYDNEY star Luke Parker continued a strong return from off-season knee surgery as the Swans held off a late charge from St Kilda to win by three points at Lavington Sports Park on Sunday. Parker collected 26 disposals on a wet night in Albury and his hardness inside the contest was often apparent. 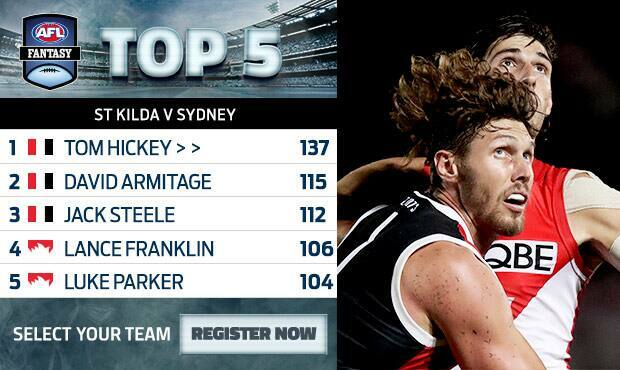 Meanwhile, Tom Hickey put in an excellent display to likely shore up a spot in St Kilda's round one side. He had an equal team-high 29 disposals, along with 18 contested possessions, as the Swans won, 0.11.11 (77) to 0.10.14 (74). Slippery conditions made it tough, with dropped marks and players falling over a common sight. 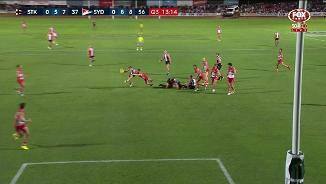 A heavy fall for experienced Sydney full-back Heath Grundy forced the defender off the ground in the last quarter with a head knock after Josh Bruce flew for a mark and landed on the Swan. "The doc said he's OK but it was obviously the last quarter, so we didn't worry about putting him back on," Sydney coach John Longmire said. Superstar forward Lance Franklin looked in fine form after a shoulder reconstruction limited his pre-season. He notched up 22 disposals and had the better of Jake Carlisle in their duel, with his delivery to his teammates a highlight, although he will want to convert better after booting 2.4. A rare kick with his right foot came in the second term when he snapped at goal, although his attempt was off-line. Dylan Roberton, who was named in the leadership group this year for the first time, spent time on Franklin when the Swan pushed up the ground and handled himself well, despite his size disadvantage. A desperate lunging spoil from the former Docker in the second quarter when it looked as though Franklin would mark uncontested showed his desperation, while a big tackle in the last term on Dean Towers won St Kilda a free kick. After a full pre-season, tough nut David Armitage looks likely to bounce back from an inconsistent 2016 after he won 27 disposals. His work in the contest, alongside Jack Steven (28 disposals) and Jack Steele (27) means Alan Richardson will have an imposing midfield unit. Inaccuracy in front of goal plagued Bruce, who finished with 0.3 – the same haul as his teammate Jade Gresham. 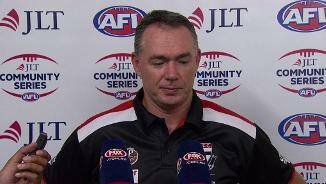 St Kilda coach Alan Richardson said the result came down to missed chances. "I just felt we blew some opportunities, whether they be shots in front of goal or even some of our connect on offence," Richardson said. "But there were a lot of positives. Our contest work has been really strong throughout the pre-season competition. The way that we've defended as a unit has improved again. "I liked what I saw for really big parts of the game." St Kilda brought scores level in the third quarter after goals in quick succession to experienced pair Sam Gilbert and Nick Riewoldt. The former skipper's effort showed his class after he snapped it through with his non-preferred left foot. Kurt Tippett played a large part of the game forward with Sam Naismith and Darcy Cameron taking the majority of rucking duties. A strong mark against Nathan Brown and Sam Gilbert showed Tippett's aerial prowess will be more than handy close to goal. Paddy McCartin struggled on a night not suited to big men after rain began falling in the second quarter, with a sprayed set shot in the last term summing up his night. He copped a couple of knocks which saw the trainers come out to check on the forward, although he waved them off both times. Longmire was satisfied with his side's performance against a Saints outfit that had been undefeated in the JLT Community Series. "We knew coming here that St Kilda were in really strong form and playing a really good brand of footy," he said. 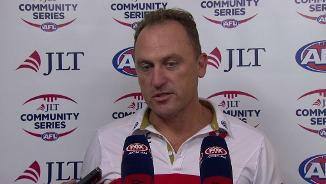 "They've got some quality recruits over the summer so we knew it would be a tough battle, and it was. We're really happy to come out with another good, hard game under our belt before the season starts." St Kilda: There are a couple of extra big bodies in defence with Jake Carlisle and Nathan Brown donning the red, white and black, but their additions to the side won't necessarily be seamless. Both were serviceable but Lance Franklin and Kurt Tippett were able to have an influence. Carlisle will take time to hit top form after missing all of last year with a doping ban and having to recover form hip surgery but the Saints will need both to play well if they are to make a serious push for finals. Sydney: A forward line that has looked one-dimensional in the past should have more options this year. Kurt Tippett spent much of his time forward while Sam Reid is an excellent third option. Having that pair available to play in attack means Franklin can push up the ground and use his brilliant field kicking to deliver the ball to perfection, and having the superstar running into the forward line is probably the most difficult task a defender can face in the AFL. St Kilda: The job of minding Lance Franklin when he played deep in attack was handed to Jake Carlisle. Franklin won the duel but Carlisle showed enough to suggest he should seriously strengthen St Kilda's defence, with an intercept mark in the second quarter at the top of the goalsquare a highlight. Similarly, Kurt Tippett had the better of Nathan Brown for most of the night. Jack Steele made sure his tackles were felt and won plenty of the ball. Koby Stevens fell ill after he ate a dodgy prawn and he did not take to the field. Sydney: Darcy Cameron didn't have much of a chance to push his claims for the second ruck spot after playing only 42 per cent of game time. He finished with five disposals and a goal after he nailed a difficult set shot. There were glimpses of class from Oliver Florent while his hardness was apparent after he picked up 10 contested possessions. Will Hayward got on the end of a goal after a handball from Franklin. A conceded 50m penalty after Hayward knocked the ball out of Jimmy Webster's hands after the Saint marked was disappointing, with a goal the result. Robbie Fox was relatively unsighted. 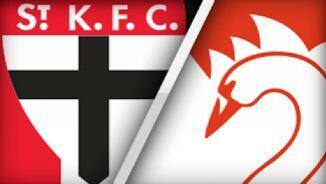 St Kilda look to make it 15 wins in a row against Melbourne at Etihad Stadium on Saturday, March 25. Sydney begins its home and away campaign the same day versus Port Adelaide at the SCG.